Jaroslav Prochazka is utilizing his strengths for more than 13 years in IT industry in various development, maintenance and management roles and positions. He has 9 years coaching and mentoring experience in distributed environment. He has worked with about 650 people and has trained more than 1300 people so far. He published a book on Agile and Lean support and maintenance in 2011 and other free e-books on Agile and Lean topics. Jaroslav focuses on longer-term initiatives conducted together with management (more systematic and sustainable) also including soft skill workshops and coaching to utilize his experience and interest in psychology. His favorite tools are Kaizen workshops and (Agile, Lean ITIL) games, because people find their “aha” moments by themselves. 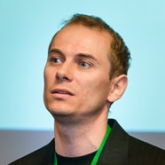 Jaroslav earned his Ph.D. at University of Ostrava in 2007 and was also researching and teaching Software development and Information Systems for 10 years there. He speaks at international conferences like Agilia, IBM RSDC Conference 2009, Information Systems Development 2010, International Conference on Global Software Engineering 2011. Current trend of startups is cool, right? Many people want to work for some just because the culture or lifestyle. Internal startups are even cooler. Many companies run their own startup with loud parade. But what is not as cool, unfortunately, is the way companies setup and manage their internal startups. Internal startup is as risky as the external one. Only 10% succeed. Only benefit of the internal one is access to some resources, external startups do not have (technology, sales channels, etc.). But at the same time it is harder for the internal one due to 2 battlefields: market and internal politics. Companies still follow many anti-patterns with internal startups, starting with the way they set and manage it, ending with the way of working and evaluating false positives they get. This talk will discuss lessons learnt from internal startups and provide directions so they contribute to a future company business utilizing current strengths and fulfilling market needs at the same time. Startup world is a tempting area in current IT world. Everybody would like to be somehow connected. Thanks to this trend also corporations start to run their internal startups to boost current business or find the place for emerging technology. But quite often they struggle and do not bring expected results. What makes this internal effort hard is a specific way of working and managing. You cannot drive it the same way as existing business. Why? The meaning of existing company is to optimize and improve existing business. On the other hand, startup does not have any business yet. Therefore the goal is to find its market, product and business model first, make it working and scale it. The main theme of this workshop is how to initiate and run internal startup if its nature is actually total different than existing business. • Where to place it? o Products, Development, Technology, different company? How to make internal startups?